When I was out during the Pride celebrations this year, I had the pleasure of drinking a cup of the Yin Zhen variety of Earl Grey at a café, which I had not tried before. Like other varieties of Earl Grey, the wavy, small and thin leaves are offset beautifully by cornflower blue petals, but the Yin Zhen is also ornamented by longer silvery white tips. A distinct scent of citrusy Bergamot, which I have always preferred as a scent rather than a flavour. The liquid is a maroon rather than the usual cinnamon hue of other varieties, and I found a distinct bark-like aroma peculiar to this blend, that accompanies the Bergamot. 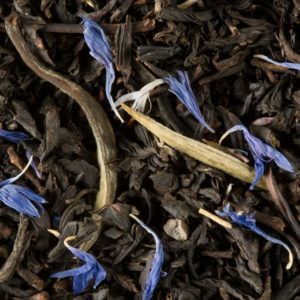 An Earl Grey that brings something different for the eyes, and would appeal to those who prefer herbal rather than floral aromas in their tea. The blend is supplied by French purveyor DAMMANN Frères who use Calabrian Bergamot, and offer not only loose leaves but also cup-size portions of whole leaves in cristal satchets. The white tips in the leaves have given the blend its name “Yin Zhen” (silver needle). Infuse in boiling water for 4-5 minutes.